In a recent post I looked at the best way to add tables to your WordPress posts and pages. At the end of that guide I mentioned a few plugins that can help you create attractive price or feature comparison tables. After spending some time trying out a few of those options, here is a guide to the best plugins for adding price or product comparison tables to your WordPress site. I’m sure you’ve all seen this type of table before when checking out the pricing plans of a particular service, or viewing a product comparison website. 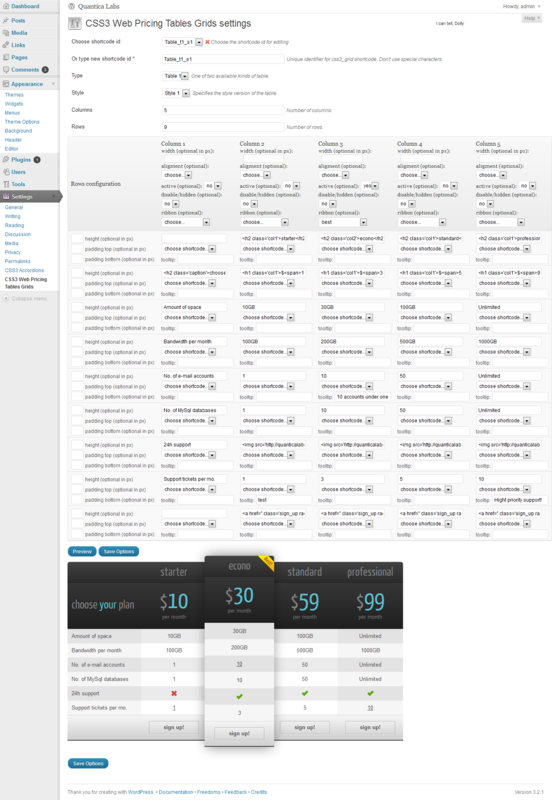 One good example from a WordPress-related product is the pricing plan comparison table used by Gravity Forms, the advanced form builder for WordPress. These tables make it easy for users to quickly compare multiple options at once and then make a decision and take action it. While they might look quite complicated to make, thanks to a selection of plugins, some free and some premium, they can be built very quickly and in most cases easily updated. Comparing the features of different pricing plans is a common use for this type of table. If you offer a service online, such as access to a tool, or creating something for a client, then a pricing grid table is an ideal way of presenting the different options for easy comparison. However, even if you aren’t selling something yourself, you can still make great use of one of these tables. Perhaps you run a review site and want a way to compare a few products you’ve written about. These could be films, cars, software, web hosting, or even holiday destinations. By using one of these tables you can easily create your own list of criteria to compare and then enter the information into the table. If you do any kind of online marketing then creating a product comparison table for your affiliate site is a very quick way to increase conversions and click through rates, as well as giving your site a more professional edge. Whatever your site, there is a good chance that it can benefit from one of these comparison tables, whether it’s to compare products, services or just the things that you write about. Here are the two best or most popular free options, and two of the best premium plugins, for adding one of these tables to your site. The premium options are very affordable and are definitely worth taking a look at, especially considering the extra features they provide over that which is on offer from the free options. This free pricing table plugin doesn’t have many downloads compared to some of the other free options out there. However, it does have a favourable rating of 4.5 out of 5 and seems to be regularly updated, increasing the chances it will continue to work as the WordPress core gets updated. The pricing or comparison tables you can create with this plugin are responsive so they will resize to best suit the width or your post column as well as for use on small screen devices. You are limited to 10 columns with this plugin but any more than that is likely to result in very wide tables anyway. You can create unlimited rows with Easy Pricing Tables. With Easy Pricing Tables you can also edit the appearance of the tables using the colour picker and by changing the fonts and the roundness of the corners. Columns can also be easily rearranged using the drag and drop interface. There is also a premium version but with such high prices compared to other premium options, it’s not the best choice. However, for free users this is a solid choice that looks good and has a decent range of features. This is a free pricing table plugin that has over 135,000 downloads making it a popular choice. It looks like a pretty good option and comes with two nicely designed templates for the appearance of the tables. However, there were a few problems with Pricing Table. One issue is that there is no way to edit the product or feature title. This means if you want to make changes to the header row on the table you have to find a workaround, such as creating a new column with the new title and then manually copying over the contents from the old column. Also the ability to add a hover-activated tooltip did not work at all when I tried it. However, the tables do look pretty good, despite a few issues surrounding their formatting and the lack of their ability to resize to fit inside the width of your post content area. If you accept the limitations of this plugin, you can easily add a basic comparison table to your site without spending a penny, although it can be a frustrating experience. This is a premium plugin for creating price and feature comparison tables in WordPress, but at just $17 it represents excellent value. The pricing tables are responsive so they will automatically resize depending on the dimensions of the screen they are being viewed on, from desktops to smartphones, and everything in between. Something which some of the free options aren’t capable of doing. The tables are very attractive and there are many, many options for setting the appearance of your tables, with plenty of colour schemes to choose from too. The tables support images and videos allowing you to create media-rich tables that will attract the attention of your readers. This makes them ideal for comparing products from sites like Amazon. The pricing grids are easy to setup and creating multiple tables for use on different posts on your site is not a problem. The number of columns is limited to five which might be too restricting for some users. However, tables with more than five columns could start posing width-related problems for your site and in those cases using something less decorated such as TablePress might be a better option. With over 2,000 purchases of this plugin and great user feedback on Code Canyon, Go – Responsive Pricing & Comparison Tables is an excellent choice for adding premium comparison tables to your WordPress site. This is the most popular premium pricing table plugin for WordPress, with over 5,000 purchases. At just $15, it’s another great option for those looking to help their site stand out from others that are using the free pricing table plugins. Like the Go plugin above, there are plenty of styles to choose from, although not quite as many. However, I think the tables you can create with this plugin look a little bit better. The options page for creating the tables is well-designed, although due to the large number of features of this plugin, it can look a little overwhelming at first. You can preview the table you are building on the options page, preventing you from switching windows and tabs when customising the appearance. The tables that are created with the CSS3 Responsive Web Pricing Tables Grids plugin are responsive for use on multiple screen sizes. The tables can include hover-activated tool tips for displaying more information to your readers. The plugin also allows you to create tables with unlimited rows and columns which will be useful for those comparing many products, features or services. Media elements such as images an videos can also be inserted into the table cells. For $15 you can’t go wrong with this feature-packed, easy to use pricing table creation plugin. While the free options, especially the Easy Pricing Table plugin, do let you create pricing or feature comparison tables and grids quite easily, the premium options are probably a better choice for all but the most non-professional of websites. For just a few dollars you can get a big upgrade in functionality and really make your pricing tables stand out for all the right reasons. Of the premium option, the choice comes down to Go Responsive plugin vs. CSS3 Responsive plugin. Both have pretty much identical features and the deciding factor will probably be which of the included templates most appeal to you. What are you planing to compare using your table and which plugin is the best option for you?